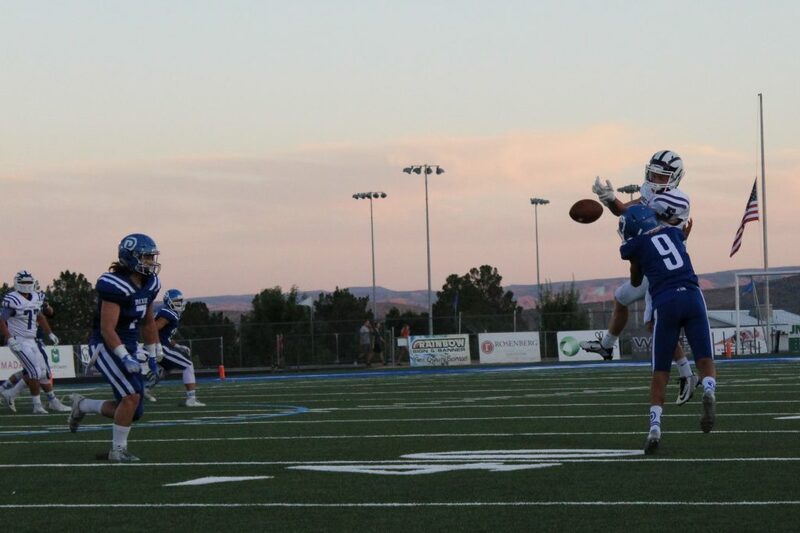 ST. GEORGE — Here are the final scores for Region 9 high school football games Aug. 31. Region play begins next Friday. 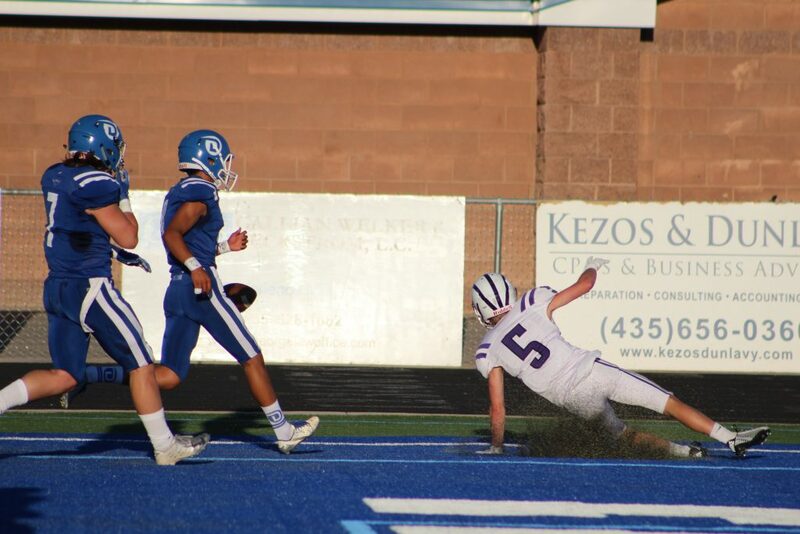 The Tooele Buffaloes had nowhere to run Friday night at Walt Brooks Stadium as the Dixie Flyers soared to an easy 49-14 victory. The Buffaloes, a team best known for their running game, were held to few yards and almost always prevented from converting on third down by intense defensive play by the Flyers and OLB Nihoa Kaonohi who had five sacks on the night. Set up by a 4-yard carry by WR Keaton Schweitzer late in the second quarter to keep the Flyers possession alive, WR Nate Mahi had the most exciting play of the night with an over-the-head catch to score a touchdown ending the half at 35-14. 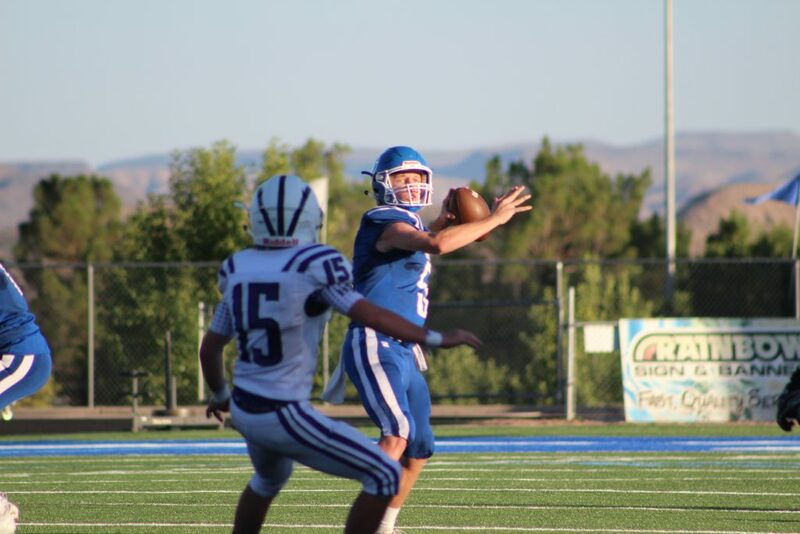 However, it was QB Reggie Graff with a nearly unstoppable passing and running game that gave his team the win. 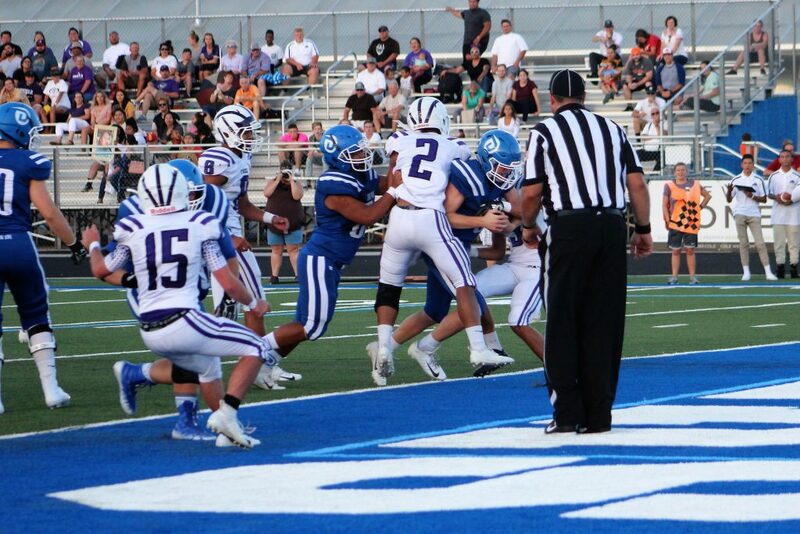 Early in the first quarter, the Buffaloes gave up their first of two turnovers of the night which Graff recovered and exploited for a touchdown the very next play making the score 7-0. He continued to pound down the field for 79 yards rushing and two more touchdowns including a heart-pounding 35-yard run down the middle for a touchdown, the final score in the win. 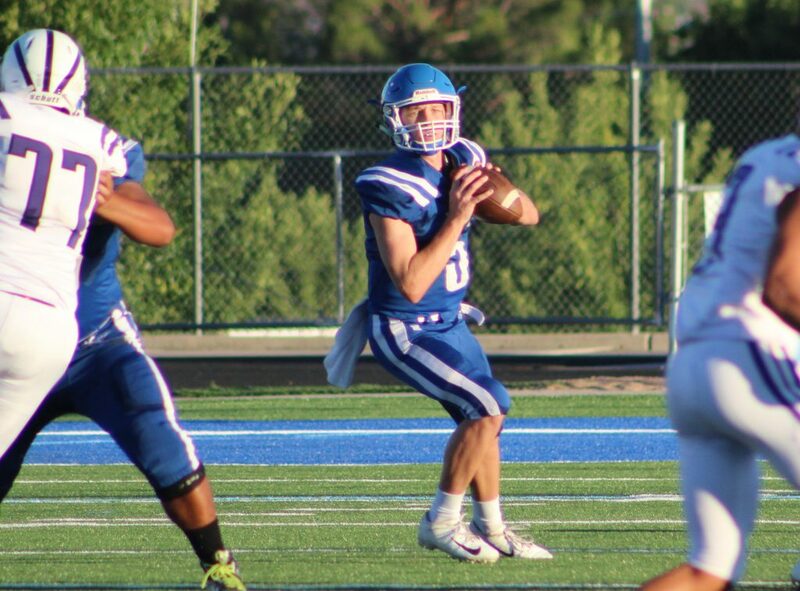 Graff passed for nearly 300 yards in leading his team to a record of 2-1. Next week, the Flyers will open Region 9 play by hosting the Cedar Redmen at 7 p.m. Friday. At Cedar, the Redmen prevailed in a low-scoring battle, holding off the North Sanpete Hawks for a 14-6 victory. Neither team moved the ball much on its first possession, but North Sanpete managed to get inside Cedar’s 25-yard line on its second drive, with a key play being QB Chance Clawson connecting with wide receiver Ethan Bowles for a 49-yard catch. 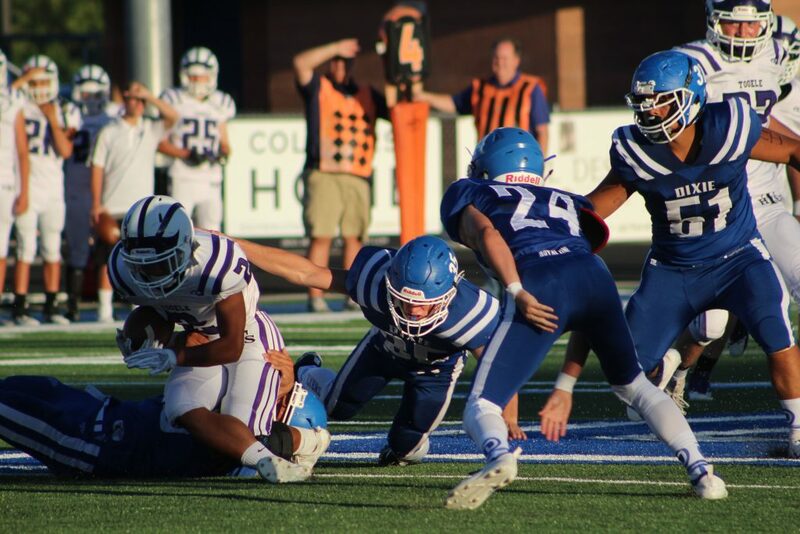 Cedar’s defense managed to prevent another first down on the drive, however, as the Hawks came up one yard short on a fourth-and-two rush attempt. Taking over on downs at their own 22-yard line, the Redmen then embarked on a six-minute, 78-yard scoring drive that culminated in a six-yard TD run by Kolbe Meek with 24 seconds left in the first quarter. Zane Montgomery added the PAT kick to give Cedar a 7-0 lead. Neither team scored again until midway through the third quarter, when Cedar, having just taken over the ball at the 50-yard line, scored on a long pass from Jaxson Garrett to Tayvien Brown, who broke a couple tackles as he scrambled his way into the end zone after making the catch. Montgomery’s PAT kick was good, giving Cedar a 14-0 lead. 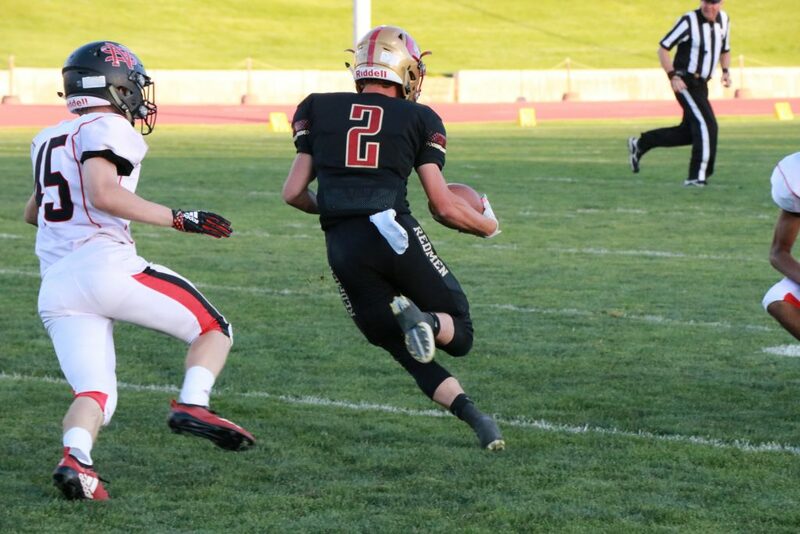 Early in the fourth quarter, the Hawks caught a break when a receiver managed to catch a deflected pass on fourth down and 13, giving North Sanpete a fresh first down at Cedar’s 25-yard line. A few plays later, the Hawks broke the shutout with a 1-yard TD run by Brock Justesen. The PAT attempt failed due to a bobbled snap, however, so North Sanpete still trailed by eight with 8:25 left. 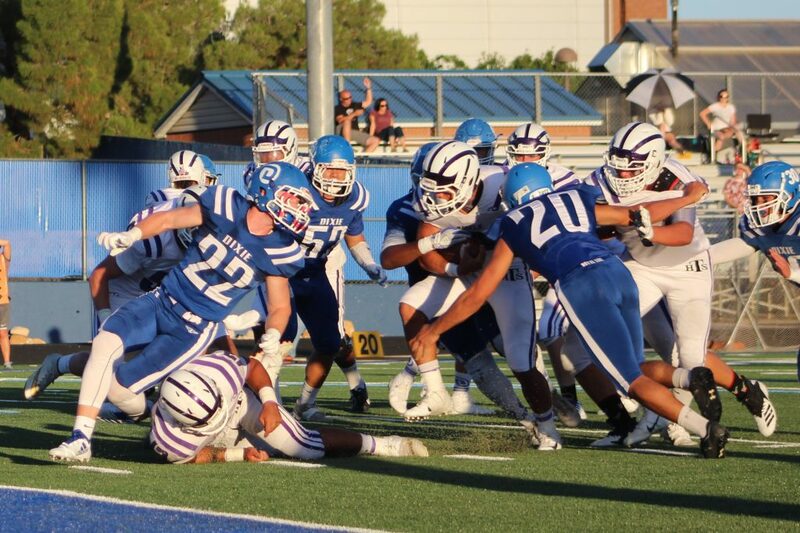 Cedar’s defense managed to keep the Hawks from scoring again. North Sanpete’s last drive ended on a fumble followed by a tackle for a large loss, on fourth-and-seven on Cedar’s 28-yard line. The Redmen then ran out the clock to pick up their second straight win in as many weeks. Cedar head coach Josh Bennett said although he was happy his team got the win, he was “a little disappointed” in the offense. 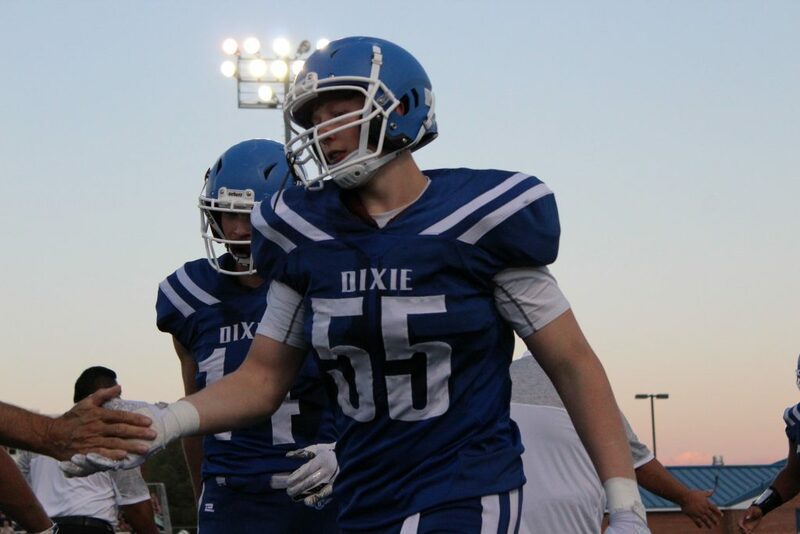 Cedar plays at Dixie next Friday in the region opener for both teams. 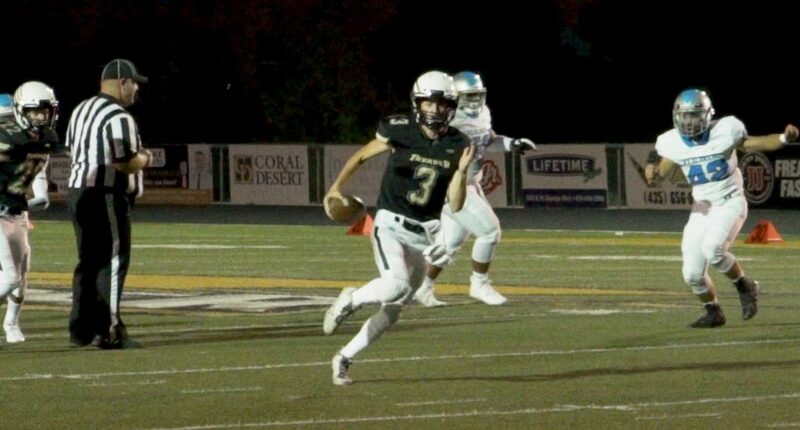 Desert Hills rolled to a 18-0 halftime lead over their Hawaiian visitors with a pounding ground game and finished out the night with a 42-0 victory. The Thunder scored early after the WaveRiders tried a fake punt and turned the ball over at their own 23. Two plays later, Kina Taufa plunged through the line to score. Logan Callister converted the first of many extra points in the game for the Thunder. The WaveRiders had traveled some 2,800 miles to face the Thunder. With a 30-man roster, they were outmanned by the Thunder. It was the first win of the season for the Thunder after an 0-2 start. They will host Snow Canyon next week to begin Region 9 play. 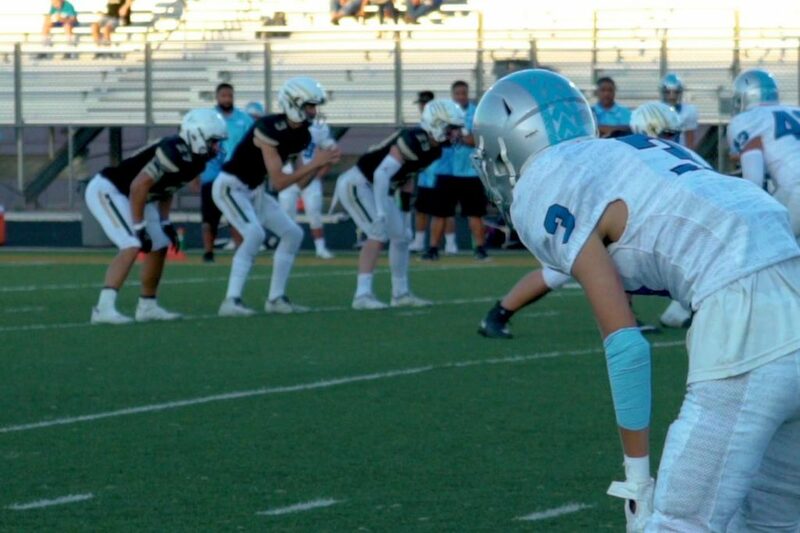 In a back and forth battle, Snow Canyon fell to Shadow Ridge, Nevada, in the final quarter as the Mustangs rallied for a 36-29 victory. The Mustangs scored first early in the game but Landon Frei ran for two touchdowns to keep the Warriors in the game, 21-16, at halftime. Snow Canyon took the lead midway through the third quarter on a 3-yard run by Ryan Bethers and Matt VanGills’ PAT. Marshun Swinney pulled in a 69-yard pass from Frei to give the Warriors a brief lead in the second half. 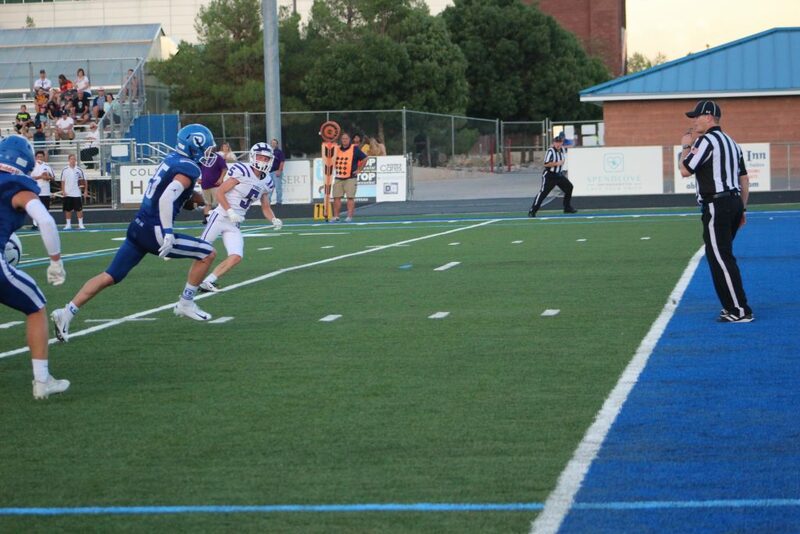 However, Shadow Ridge came back on a 37-yard run to tie the game with eight minutes left in the game. The Warriors took a brief lead on a 69-yard pass play from Frei to Marshun Swinney but the PAT failed. 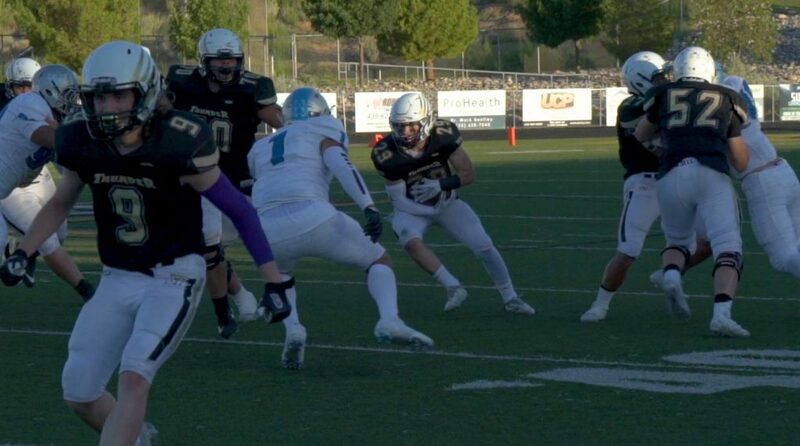 Shadow Ridge came back with a 37-yard and 11-yard run to ice the victgory with less than a minute to play. The Warriors will open region play next week at Desert Hills. 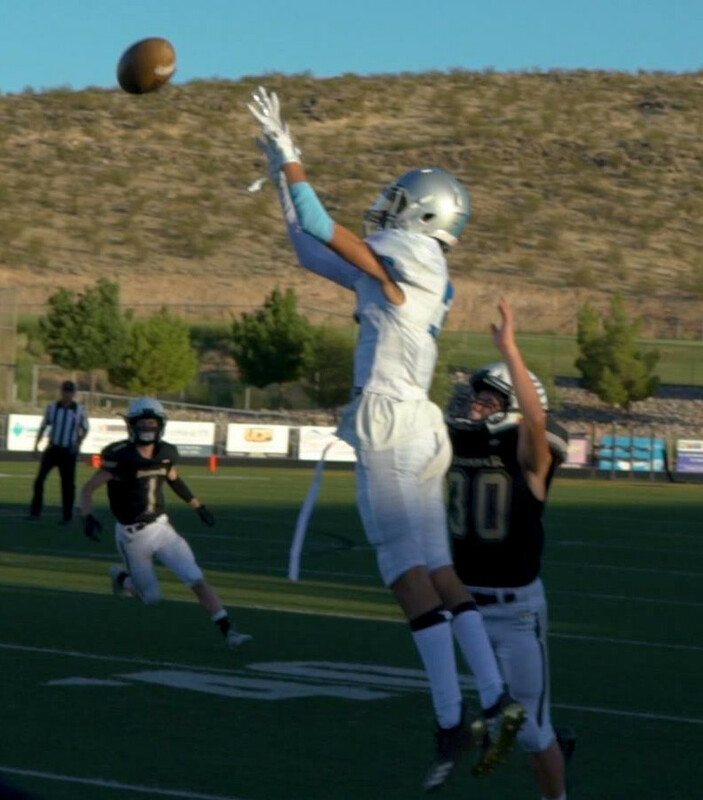 Scoring at will, Pine View rolled over Hunter, 49-7, to improve to 2-1 in the preseason. The Panthers struck first on a 4-yard run by Tosh Wright and the PAT by Connor Brooksby. 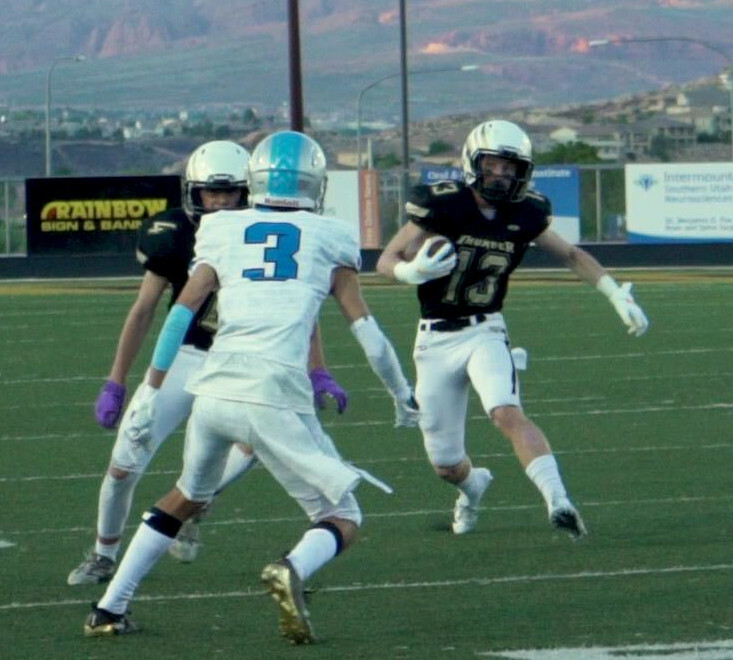 Hunter retaliated with a 30-yard pass play but Pine View came back on a 2-yard run by Rosh Wright, and Dallin Brown caught a 21-yard pass from DaiSean Cash to make it 21-7 in the first quarter. Brown then scored three more TDs, including an 83-yard pass from Macloud Crowton as the Panthers rolled to a big halftime lead. Neither team scored in the second half with the game safely in the Panthers’ pocket. Pine View will travel to Canyon View next Friday to open Region 9 play. 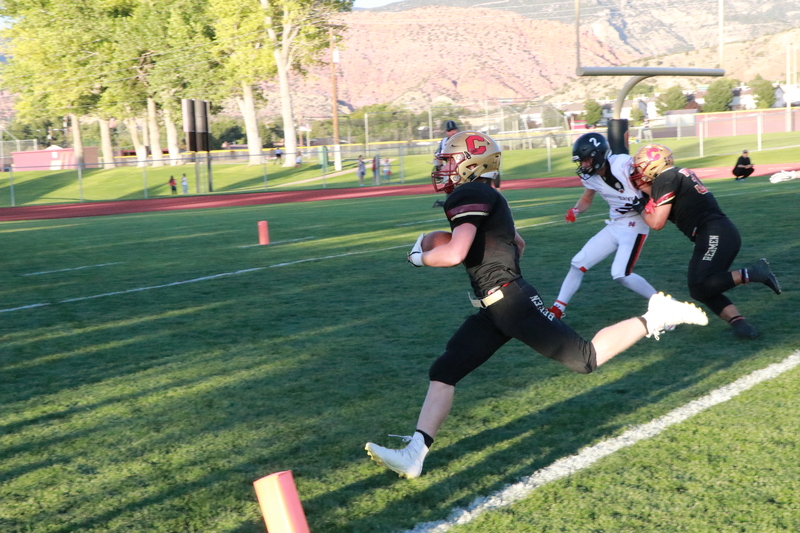 At Juab, the Wasps led 7-0 after one quarter, but the Tigers managed to tie the game 7-7 early in the second period, thanks to a Ian Lambert’s 11-yard TD catch from QB Brock Starley, with Raymond Cordova adding the PAT kick. 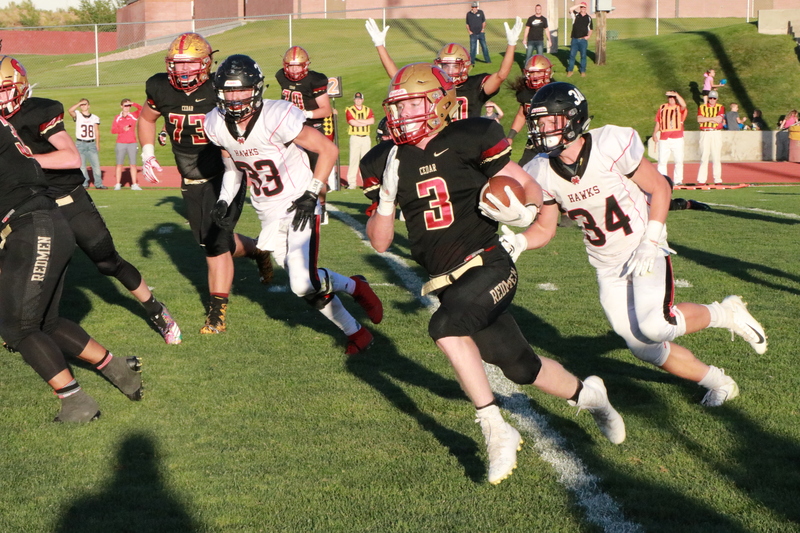 Juab then scored five unanswered touchdowns during the second and third quarters to build a 41-7 lead heading into the fourth quarter. The Tigers managed to tally one more TD with just under five minutes left in the game, as Christian Haynes broke free for a 54-yard scoring run. 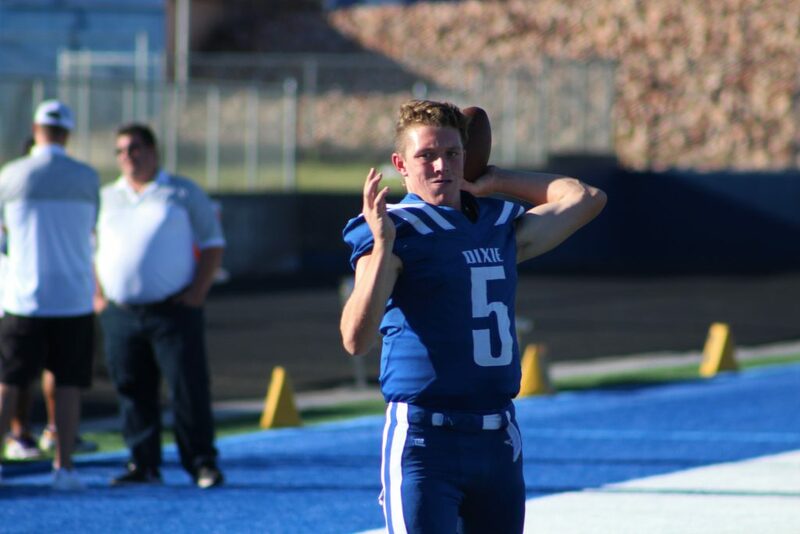 Hurricane will have a bye next week, but the Tigers will open region play by hosting Desert Hills Sept. 14. 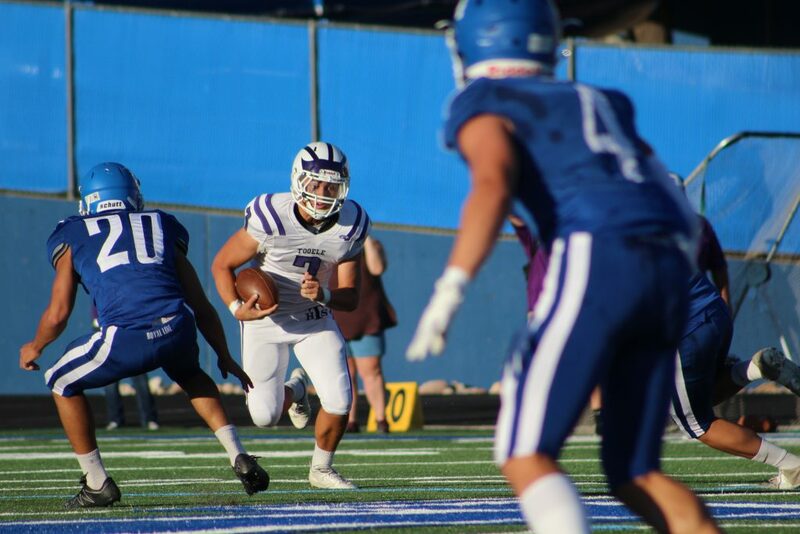 At Timpanogos High in Orem, the Timberwolves scored seven unanswered touchdowns in the first half to put the game out of reach. Canyon View scored first, two minutes into the game, on a four-yard TD run by Colten Shumway. Hunter Talbot’s extra-point kick made it 7-0 for Canyon View. After that, the Timberwolves scored 49 straight points in less than two quarters of play, including two interceptions run back for TDs. Canyon View managed to score another TD in the closing seconds of the first half, on a 12-yard run by Shumway to make it 49-14 at the half. Each team scored one more TD in the second half, as the clock was kept running due to the mercy rule. Canyon View will play its first home game of the season next Friday when it hosts Pine View for the region opener.